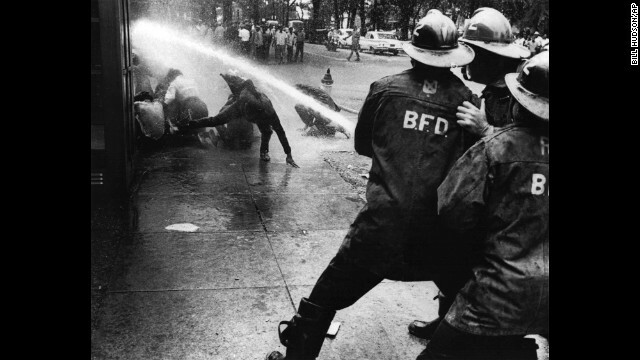 When it comes to 1960s civil rights protest history, Americans are likely familiar with the documentation of activist efforts like the 1965 Selma March, iconic images of black students getting attacked by dogs or sprayed by fire hoses in Birmingham, or transcripts of MLK's "Bus Boycott" speech in Montgomery delivered just days after Rosa Park refused to give up her bus seat. But outside these now-landmark moments in the South that largely inform our collective understanding of black activism in 60s, the visual history of similar resistance efforts in areas like Philadelphia, Cleveland, Los Angeles, and Seattle remain largely forgotten. A new book titled 'North of Dixie: Civil Rights Photography Beyond the South' seeks to spotlight overlooked moments in the civil rights movement in areas of the country that were seemingly better off for black Americans, and also showcases the less-prominent grassroots action that fought discrimination—local events the mainstream media (and subsequently history books) often ignored. For the past decade, author and historian Mark Speltz has researched civil rights photography from the North, unearthing a colossal archive of imagery that would otherwise be invisible today. "It became clear early on that local activism that took place in the North, West, and beyond was all but absent in the way we characterize, teach, and remember the era," Speltz said. "The absence of pictures in common circulation convinced me the visual story of the movement up north and beyond Dixie still needed to be told." The book features 100 images by photographers like Bob Adelman, Gordon Parks, and others involved in the fight against oppression, some photos which are being published for the very first time. It also includes text sections that explore topics such as how the police used pre-digital surveillance tactics against black dissidents, effectively turning film photography into a weapon in some instances. VICE talked with Speltz about North of Dixie to get more insight about how "the photography made visible the bravery, dedication, and agency of ordinary Americans from coast to coast." © Bob Adelman / Magnum Photos. New Jersey, 1962. Boy picketing outside a local school, one of the many children from coast to coast who would play a critical role during the civil rights era to advance the struggle for racial justice. VICE: Can you give me a bit of background on your professional work and how it's previously intersected with photography, as well as civil rights/race issues? Mark Speltz: As a public historian for the past 20 years, I have been fortunate to work on books, exhibitions, and community history projects of all kinds. Identifying visual materials and objects that communicate fascinating but lesser-known stories about the past has been a central theme throughout my professional experience. My fascination with civil rights era imagery took a scholarly turn a decade ago while in graduate school in Milwaukee, Wisconsin where I began exploring the visual history of the city's long struggle for civil rights. Like millions of Americans born in the decades following the 1960s, I learned about the civil rights movement through the most well-known images. I was fascinated by the compelling pictures from Little Rock, Arkansas, Birmingham, Alabama, and elsewhere, but didn't realize how these pictures only told part of the story. Despite growing up in the Midwest, I had never heard, or seen pictures of, struggles beyond the South. As I read widely about campaigns in Milwaukee, Chicago, Detroit, Seattle, and beyond, the stories and images opened up a whole new world for me. The photography made visible the bravery, dedication, and agency of ordinary Americans from coast to coast. © Leonard Freed / Magnum Photos. Brooklyn, New York, 1963. Demonstrators sitting with signs and intentionally blocking traffic during protest on car-lined thoroughfare. The book talks about how the media and public ignored local campaigns in favor of more "shocking" imagery. Why was that the case, and what effect do you think that erasure had on how we understand the history of the civil rights movement? Broadly speaking, the mainstream press in northern communities preferred to bury coverage of local civil rights struggles. It was simpler to ignore and downplay inequality in your own backyard and point a finger at the seemingly backward South where most wanted to believe America's racial issues existed. The heavy reliance on attention-grabbing pictures coming out of the Southern civil rights struggles illustrated these preferred narratives. As early movement histories were written, an overwhelming majority of activists and historians focused on the most well-known Southern campaigns, politicians and leaders, and landmark legislation, leaving smaller locations and campaigns to be largely forgotten. Decades of research and public history projects by activists, local historians, and civil rights scholars have shined a light on critical campaigns that were conceived of, built by, and waged locally by ordinary Americans nationwide. This scholarship has worked to reverse that erasure. Also, for so long, the most iconic civil rights photographs emphasized a very Southern struggle. Pictures of nonviolent demonstrators being brutally repressed, attacked with police dogs, or facing racist violence are reprinted often in textbooks. The view is further circumscribed by highlighting the most charismatic male leaders, political actors, and legislative achievements. This longstanding focus, coupled with a celebratory emphasis on nonviolence overcoming Southern racism, has rendered critical struggles elsewhere, alternative tactics, and less-noteworthy locations all but invisible. In contrast, the wide variety of photographs in North of Dixie capture the breadth of the movement, diversity of tactics, and true scope of America's racial issues. Photo by Charles Brittin. Los Angeles, California, 1963. Activists picketing at a demonstration for housing equality while uniformed American Nazi Party members counter-protest in the background with signs displaying anti-integration slogans and racist epithets. Can you talk about the research process for the text, as well as how and where you obtained the images? Did your research lead you to any unique places or sources? I am an incredibly persistent researcher and scoured the internet for ideas, leads, and contacts to help collections, photographers, and images. In addition to museums and archives, I connected with newspapers, magazines, and photographers who worked in the North and South, such as Bob Adelman, Robert Abbott Sengstacke, Doris Derby, and Bob Fitch. I went on research trips, mailed a lot of letters, sent hundreds of emails, and ultimately included works by over 50 different photographers who were photojournalists, artists, activists, and amateurs. I think the variety of perspectives, not to mention 25 different cities included, helped me provide a broader view of the nationwide struggle. How did you approach the curatorial process of selecting the 100 images that appear in the final book? Was there material you wanted to include but didn't fit the final edit? In recasting the visual narrative away or past the most iconic imagery, I hoped to make visible the lesser-known, but equally-inspiring, stories from LA to Harlem and from coast to coast. Of course, there were countless campaigns against myriad forms of discrimination in the North and West that covering or mentioning each one was impossible. My goal was to illustrate little-known struggles with images that encouraged readers to linger over them. Some of the images are rare and have never been exhibited or reprinted. Others ran on the front pages or in Jet magazine but have faded from memory. The process of editing and whittling down the plates was complex, painful, and occasionally out of my hands. There were a handful of photographers who made important photographs that I was unable to connect with, find the right image, or had hoped to use, but the agencies and stock houses made it cost prohibitive to use much of the work. I could not be more pleased though with the final selection and order of works. They make plain the complexity of the movement nationwide. Yet, in all honesty, there are so many strong works and stories in need of telling you could produce a half dozen more book like this and barely scratch the surface. Photo by Gordon Parks, Chicago, IL 1963. Malcolm X displaying the Nation of Islam's newspaper. Courtesy of and © The Gordon Parks Foundation. Do you have any interesting stories or anecdotes about acquiring some of the never-before-seen photos that appear in your book? Locating the surveillance photographs for the fourth chapter was a fascinating experience. These types of pictures are incredibly rare, as they're typically squirreled away from public view, protected by court order, or have been destroyed. But some interesting ones turned up in Seattle, Chicago, New York, and elsewhere. Here's an anecdote that will give you a feel for the amount of surveillance photographs that were taken during the era: I requested a handful of dates or specific protests from the New York City Municipal Archives who was recently digitizing a massive collection of police photography. A note on a negative envelope absolutely blew my mind. One single NYPD photographer shot six rolls of film of one Black Panther 21 rally in 1969 on one day in Manhattan. A dramatic increase of surveillance photography during the decade of black dissent and protest and in American cities led to hundreds of thousands of police, FBI, and law enforcement photographs. Very few of these are available to researchers. Photo by Charles Brittin via Getty Research Institute. Los Angeles, March 10, 1965. Protesters being physically removed during a demonstration against the shocking violence in Selma. What else did you learn about surveillance during the civil rights era, and the interesting paradox of cameras both helping and hurting the civil rights movement? During my research, I repeatedly noticed how celebrities like Marlon Brando or Harry Belafonte attracted additional press attention to campaigns, marches, and rallies. And activists often remarked how the presence of the media and cameras served as a means of protection, though clearly, that was not always the case. Yet, the camera was repeatedly turned against activists as a means of surveillance and intimidation. Law enforcement departments and agencies, locally and federally, assembled massive archives of surveillance photography and files local activists and civil rights and Black Power groups and other organizations nationwide. 50 years later, the role of visual images, both static and live footage, continues to play a critical role advancing the struggle for rights and justice. Imagery recorded on cellphone cameras have repeatedly shocked Americans and made visible police violence and misconduct that otherwise would have gone unnoticed. Activists harness new technologies and expansive social networks and apps to amplify local concerns as part of evolving national discussions on race, policing, and justice in America. Similarly, emerging technologies aid law enforcement specialists conducting surveillance of activists through cellphone tracking, signals, and means of monitoring only now becoming better understood. Without a doubt, new technologies have expanded the reach, power, and capabilities of surveillance agencies monitoring activists. Unknown photographer via the Washington, DC, Library of Congress. Folcroft, Pennsylvania, August 30, 1963. Mob shouting obscenities, threatening a young black family as it moves into an all-white development outside Philadelphia just two days after the March on Washington for Jobs and Freedom. The family spent its first night in the cellar and, after two years of relentless attacks, moved out of the neighborhood. Why do you think now is the right time to showcase these photos and publish this book? I believe anytime is a good time for a book like North of Dixie. Stories need to be unearthed and shared. Photographs provide entry points for readers to explore and better understand the past. But it's painfully clear the book has become even more relevant than when I started it. The stories and photographs in the book provide more context to historical issues and civil rights concerns. Perhaps more importantly though, the pictures look past the most celebrated civil rights leaders and illuminate and honor the inspiring grassroots work by ordinary young Americans—men, women, and children. None of these individuals were waiting for change to come or for Dr. King to bring civil rights North to their communities. Photo by John Vachon via Library of Congress, Prints and Photographs Division,LOOKMagazine Photograph Collection. Philadelphia, PA 1956. Jackson family admiring a house that turns out to be in a whites-only neighborhood. Do you hope this book amends or rectifies the problematic nature of historical erasure and historiography biases? North of Dixie is certain to pull lesser-known campaigns and struggles out of the shadows. It is not for lack of material out there; many historians have been exploring the movement beyond the South for decades now. With each passing year, new scholars challenge longstanding assumptions, reveal new leaders, and pose new questions and theories about the most important and defining social movement of modern American history. I think the pictures in my book provide entry points for all types of readers, educators, and ordinary Americans looking beyond the Southern movement for the first time. Do you notice similar issues affecting the documentation of black protest in the present? What I worry about documentation of black protest right now is whether or not a book like this will be possible in the future. Incredible work by artists and photographers like Sheila Pree Bright and Devin Allen is making it into galleries and will help define the look and feel of protest and dissent in the Black Lives Matter era, but what will become of the critical cellphone pictures, tweets, and social media posts that provide real-time on the ground perspective of protests and demonstrations unfolding in America's streets? These concerns were top of mind for me when I reached out to well-known activist DeRay Mckesson for permission to reprint one of his August 2014 tweets coming out of Ferguson, Missouri in the aftermath of the killing of Michael Brown. Will this critical vehicle of communication, and the historical record the messages and images preserve last, or will it all disappear and be erased? Time will tell, of course. But the existence of archives in St. Louis and Baltimore trying hard to preserve the stories and save some of the digital images gives me some hope at least a small percentage of this material will last. 'North of Dixie: Civil Rights Photography Beyond the South' by Mark Speltz is out now through Getty Publications. Order the book here and see more photos below. Photo by Declan Haun via Chicago History Museum. Chicago, IL 1966. Chicagoans young and old blatantly expressing their distaste for open housing. Unknown photographer via Washington State Archives. Olympia, Washington, February 1969. Armed members of the Seattle chapter of the Black Panther Party standing on the state capitol steps protesting a proposed law limiting the ability to carry firearms in a "manner manifesting an intent to intimidate others." Photo by Declan Haun via Chicago History Museum. Chicago, IL 1966. A young woman raising her fist in a show of pride and determination during an open-housing march through the streets of Chicago.